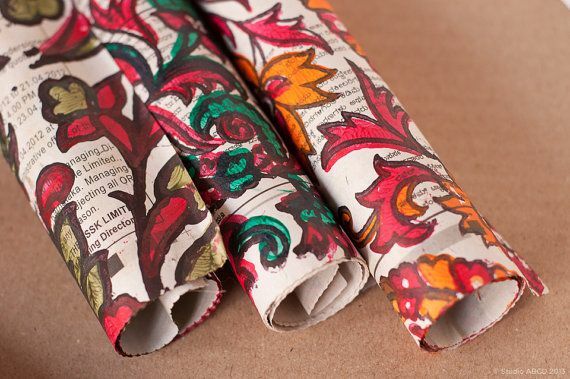 This is my personal favorite kind of gift wrap, and it’s the one that most of Fair Ivy’s vendors end up using when they send out surprises each month. Besides feeling organic and natural, it is classy, simple, and timeless. For this style, you almost always start with kraft gift wrap. I have a HUGE roll at home, for personal gift wrapping to give to friends on their birthdays, Christmas, or just as little random treats. 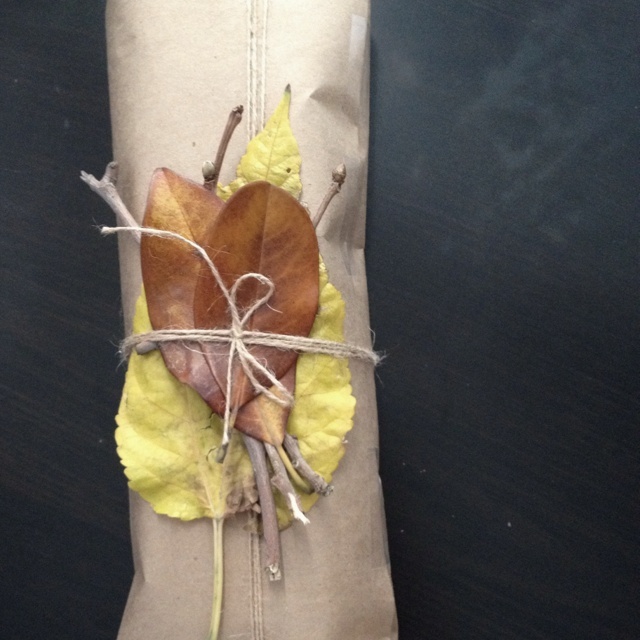 THRIFTY TIP: You can save the kraft paper that is often crumpled up and used to pad items that you receive from Amazon or ebay or anywhere else online. Not to mention a paper grocery bag, turned inside out so you don’t see the store label. Second, twine is pretty essential. You can often get this from a fabric or art store, but I know that Home Depot has it in their gardening section for much cheaper. Lastly, find something natural as an embellishment. In Fall, a combo of yellow, orange and brown leaves looks gorgeous and feels very seasonal. You can also add twigs or sprigs of a tree or plant. Rosemary and lavender is a big go-to for me, because it doesn’t wilt very quickly and additionally adds an amazing smell to the gift packaging. 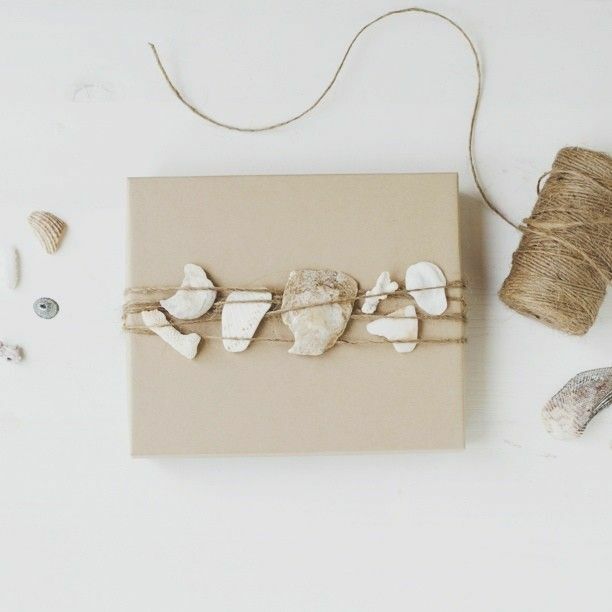 You could even use shells, small pieces of driftwood, or stones. 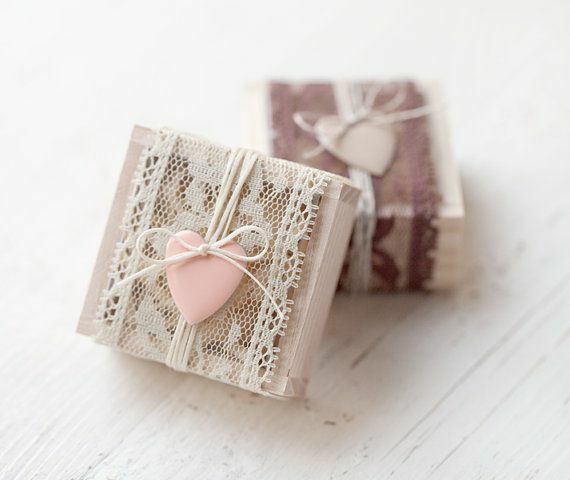 The second most-used type of gift wrapping for Fair Ivy artists is the feminine style. Like the Organic style, it is classy, but has to be a bit more well thought-out. You can’t just grab a bunch of twigs from the ground and brown grocery bags and call it a day. This is the type of packaging I’d suggest for giving as a birthday gift to a mom, grandmother, as a wedding gift for the bride, anything baby-related, or to any woman you know has a feminine style. 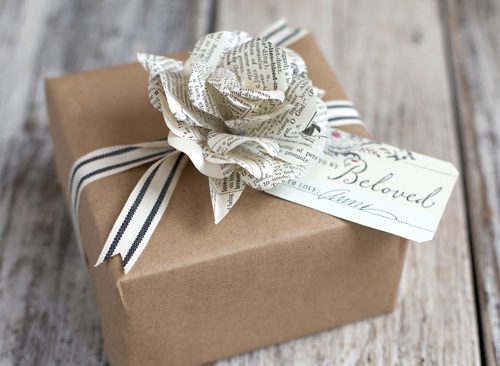 Generally, the best base plan is to start with a very neutral colored gift wrap. 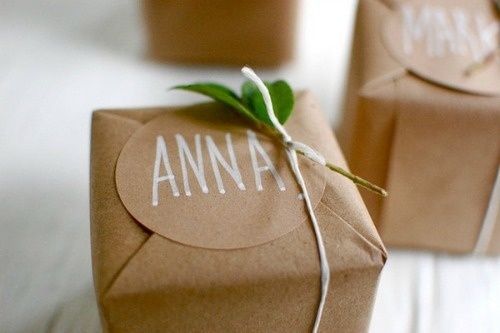 Kraft paper is still a really great plan, since it goes with pretty much anything. Beyond that, I’d suggest white or a pastel colored gift wrap (think baby girl colors). If you have access to nice fabric, definitely go with that. For the ribbon, I usually suggest lace. Nothing says feminine like a lovely piece of lace. You can purchase this type of ribbon from a fabric store. THRIFTY TIP: I haven’t done this before, but I know thrift stores often have lots of lace doilies, table runners, and curtains. It’s just the type of thing that people clean out of their attic. Buy a huge piece of that for a couple bucks, cut it into strips and you’re good to go. For the embellishment, add a small fake flower like a rose, or a heart, bell or little key. This is usually what impresses people the most, if you reveal your secrets. It’s also the most inexpensive and creative gift wrapping, usually. As I mentioned before in the Organic section, it’s great to use brown paper grocery bags (or brown lunch bags) as your base wrapping paper. However, it’s not the only way! 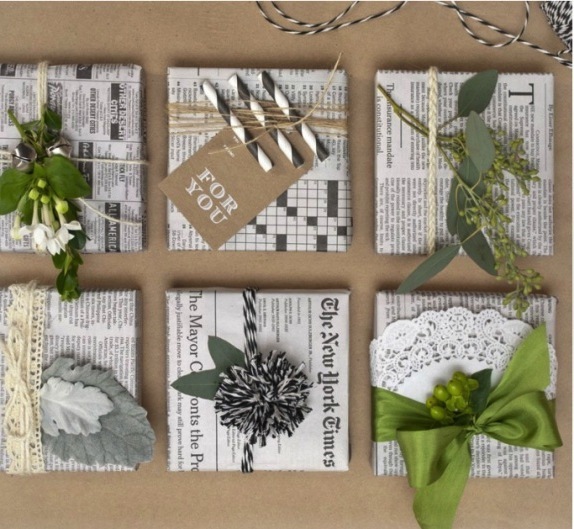 You can also use newspaper—use the black and white sections for more classy/serious gifts, and the comics area for fun and silly gifts. Add any of the free embellishments mentioned in the organic section (e.g. leaves and tree sprigs), or even paint and draw on the paper to create a bit of design. Even a magazine can be repurposed to be something crazy and cool. You can use the paper strips themselves to make a ribbon or bow. The above image actually comes from The Surpriseaholic, my personal blog. 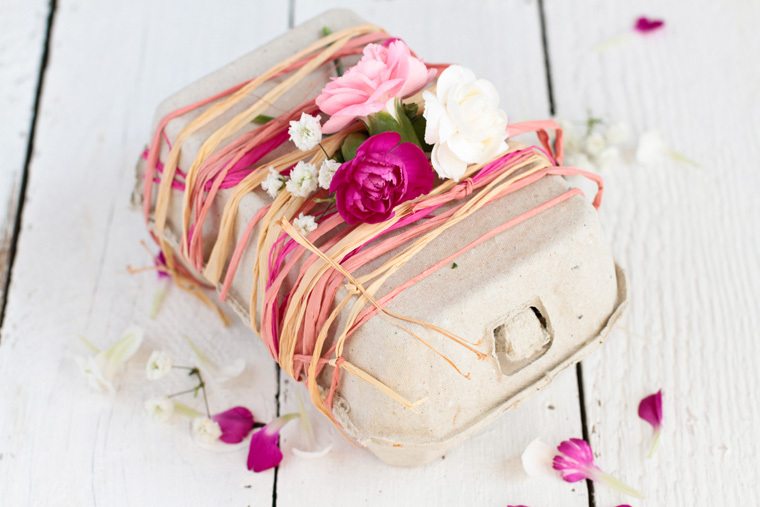 You can even use an egg or strawberry carton! Gift wrap should never be a painful or expensive experience. 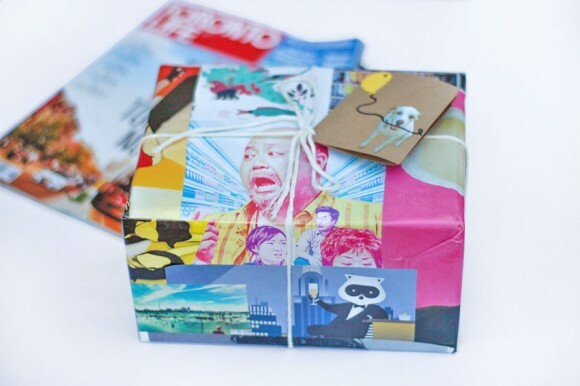 Follow the above tips and become a creative gift wrapping master! If you have any questions or want some tips feel free to email me directly: lucy@fairivy.com. Happy wrapping! Ps. 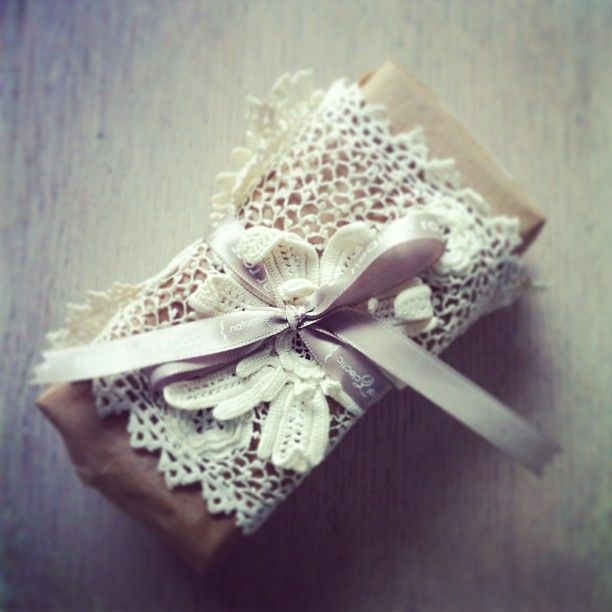 Want to receive handmade, hand-wrapped gifts like this every month?